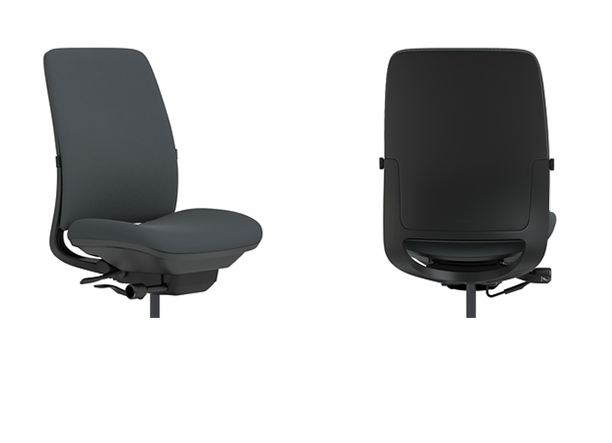 If you're in search of a back-saving ergonomic chair with all of the necessary ergonomic features, look no further than the Amia. The Steelcase Amia Chair boasts revolutionary LiveLumbar technology, which promotes a healthy posture by flexing with you as you move, delivering unequaled comfort simultaneously. Adjust the mechanism higher or lower to find that supportive sweet spot that keeps your back comfy and your mind happily productive. This popular, affordable ergonomic chair also comes with an adjustable lumbar support pad, fully adjustable arms, intuitive seat depth adjustment, and supportive cushioning in the seat and back for all-around support you can customize to your needs. Large, tall, petite - you'll feel right at home in this office desk chair. Designed to fit a surprisingly wide range of users, the Amia comes fully assembled and ready to use, freeing up time for more important work. In your search for the ideal ergonomic gear to add to your office, you might come across Steelcase products that seem cheaper than they should be. Most of these office chairs and accessories are refurbished, giving you a not-so-new seating solution that can be open to mechanical flaws and defects sooner than a new Steelcase chair might be. The Leap and Amia seem pretty similar. Should I spend more on the Leap? The Leap and Amia do share many great traits. The Leap provides a slightly more supportive backrest; however, many customers (and THS employees) actually prefer the Amia Ergonomic Chair. You really can't go wrong with either, but the Amia is a very comfortable chair at a great price. Your Steelcase Amia will come to you fully assembled. Does this chair come with a headrest? 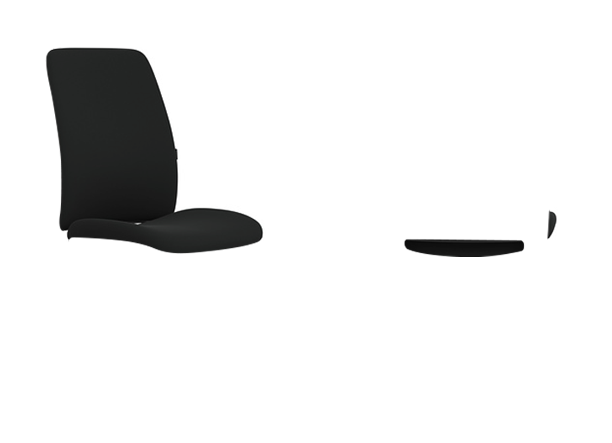 The Steelcase Amia is not available with a headrest. Is the Amia suitable for shorter people? Yes, the Amia will fit both short and tall users comfortably! One associate here is 5'1" and she said the Amia is the most comfortable chair she has ever sat in! How should I clean my Amia chair? If you spill anything on your chair, soak up the stain quickly before it sets. Use upholstery cleaner for a water-based stain or dry cleaning solution for an oil-based stain. Leather is the hardiest upholstery option, as most stains will wipe up with mild soap and a damp cloth. How does the 30-day guarantee work? If you don't like your Amia for any reason, you can return it to Steelcase hassle-free within the first 30 days. You won't even have to pay for shipping. Just contact our Support Team to set up the return. The Steelcase Amia chair is available in your choice of Black, Platinum, or Platinum with Merle frames, with or without a polished aluminum base. Buzz2 is Steelcase's standard fabric, and is composed of antimony free polyester. This material features an abrasion rating of 100,000 double rubs. Chainmail is composed of 100% Post-Consumer Recycled Polyester and features a dobby weave. This textured fabric offers an abrasion rating of 100,000 double rubs. 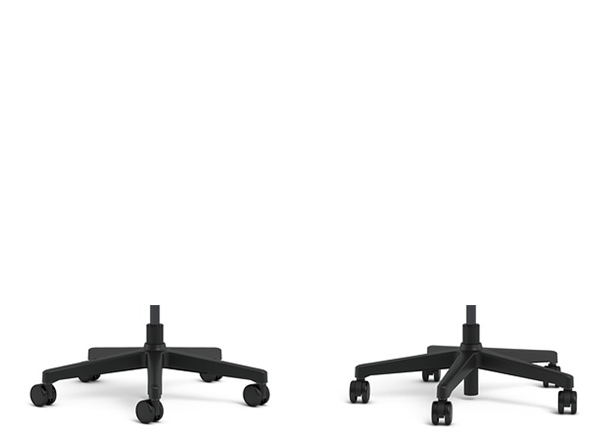 Choose a standard base to match the frame color of your Steelcase Amia chair, or upgrade to a polished aluminum base. 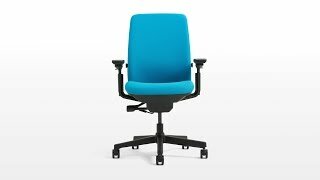 The Steelcase Amia Chair is available with or without arms. 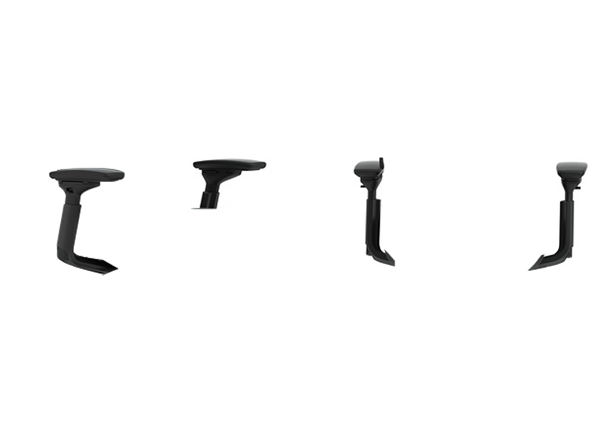 We highly recommend Steelcase arms because they're some of the best on the market. The highly adjustable arms move in and out, forward and back, up and down and pivot, so you can find the exact position for optimal support and comfort. The Steelcase Amia Chair is available in two seat heights, standard or tall. Replaced an Aeron chair with this and love it! I have had an Aeron chair in my home office for 16 years and have sat it in it every day, from 2 hours to 14. That's a great testimonial to it's quality and durability. However, over the past year I have had issues with "mouse arm" resulting in tendonitis and rotator cuff injury and a sore lower back to boot - all from bad ergonomics. My Aeron chair, perhaps due to a bad cylinder, was too low, but 16 years was enough and I wanted something new. Meanwhile I got a new chair at work. It didn't look like much, but I could not help noticing how great it felt and that, in contrast to home, I felt so much better at work. As I started my shopping research, I noticed quite a few super fancy chairs like the Aeron, but then took a closer look at my work chair - it was a Steelcase Amia! While the Human Solutions rep on the phone seemed to push me to a Leap, the reviews were a little mixed, the cost difference significant, and even Human Solutions has a published write up, from the CEO, comparing the two with a slight nod to the Amia. So I ordered it, but it is a little bit fancier than my work chair including the option for more height adjustment, platinum frame and an upgrade in fabric (Cogent). Within minutes of using this at home I felt relief due to better options in adjustment and positioning. Maybe I would like the Leap too, but since I already knew I liked this chair, why not go with it? Some of you may be tempted in thinking a great chair has to look super cool and, like the Aeron, be a candidate for a museum piece of innovative industrial design (that's where my head was at), but please try to step back and think about what is most important - your comfort. With a 30 day no charge and no shipping return policy on Steelcase, this chair should be near the top of the list of things to try. Cons: Perhaps some concern about the long term durability of the fabric and arm padding, but I could be wrong. I LOVE THIS CHAIR! I work from home and had been using a mid-level office chair from Staples. I was always reluctant to spend the money on a true ergonomic chair. I finally pulled the trigger and I am so glad that I did. You definitely get what you pay for. This Amia chair is awesome and I wish I would have bought it sooner. I am comfortable and definitely seated in a better position at my desk. I am petite and in my late 60's. How I wish I had come across this Amia chair before! There are no words to express the comfort this chair has provided for me since I bought it. I highly recommend it. Great company to work with too, when I called they were very helpful. I am loving this chair. I am in my chair 75% of the day. The other staff members are hoping to get new chairs now that this one has arrived. I find I still need a footrest in order to get in to a good ergonomic position with my desk, chair and floor. I love the back position, the arm position and the seat. So excited I didn't have to put it together as well! I am very happy with this purchase. I am very disappointed in the seat depth and chair height adjustment--I am 4'10" and have chronic low back issues from sitting in chairs that are too big for me, which is why I ordered this chair. I can't put my feet flat on the ground. Same problem with the seat depth. The lumbar adjustable feature in the back is nice, which is why I give this 3 stars, but overall I would NOT recommend this for anyone my height, particularly if you have lumbar issues. The padding on the seat is not good enough if you plan to sit for hours straight. But they say it is not healthy to sit for hours straight, so maybe that's a good thing. Overall I give it four out of five stars for comfort. I have suffered from lower back and sciatic nerve issues for years. I was to the point where I was taking vicodin for a while to see if that'd help. At the same time I started researching new office chairs, and I came across the usual suspects (Herman Miller, Steelcase, Humanscale). I was lucky to be able to test-lounge on both the Leap and Amia at a just-opened showroom in my area. I can agree with some other reviewers that have said the Amia is just a tad more comfortable than the Leap. Sure, the Amia's back isn't as flexible, but I do not notice any ill-effects from this. I negotiated a great price during an Amia sale and I couldn't be happier with the result. For those of you who have back issues and previously wouldn't have thought of spending $500+ on an office chair... I was like you. But I can tell you, it's the best investment I've ever made. I don't have back or nerve issues anymore and my posture is 10 times better now, even when I am sitting somewhere other than my Amia. You won't be disappointed with this chair. This chair is turning out to be a very good investment for me. It is very comfortable, has good adjustability and arrived completely assembled. Anybody who spends at least a couple hours a day (probably most of us) sitting in their chair, should look into getting a nice ergonomic chair such as this. I'm certainly glad I did, and so are my back and legs. The options for this chair made available from the human solution allow you to fit this chair to your style preferences and/or surroundings. Most people don't mention one of the best things about it... Made in the U.S.
Idon't think this is the best chair for a very petite person but its definately way better than my other chair. $681.00 List Price: $1,081.00* The list price is the same as the MSRP (Manufacturer's Suggested Retail Price). It may not necessarily be the price at which the product is sold.